ASC&D Gives, a committee within ASC&D Serves, donates to employee-nominated charities or causes throughout the year. The committee donated $1,000 to the Believe in Tomorrow organization to sponsor the upcoming fundraiser. 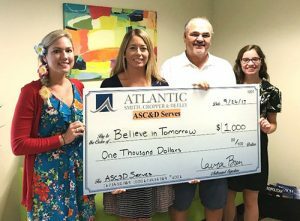 Believe in Tomorrow’s Wayne Littleton is pictured with Kasi Queen, Laura Bren and Rachel Thompson of Atlantic/Smith, Cropper & Deeley.